It was time to sample some legendary Thai food so we stopped in at a restaurant which had a menu – not feeling brave enough for street food just quite yet. Claire went for the red curry and I for the hotter green. They were both amazing ... even more so than hoped for. 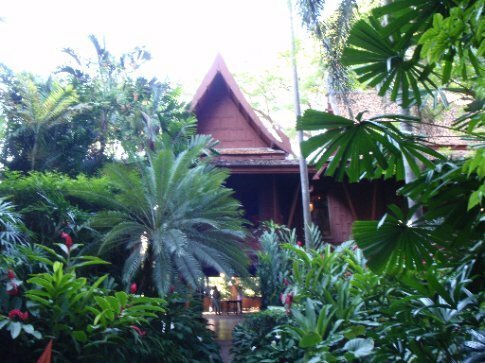 We carried on back towards Banglamphu and had a look for different digs and struck Gold at “Villa”, a beatiful oasis of a teak house in a soi (sidestreet) a bit further away from the madness of Khao San. No AC, but at 400 Baht a lot cheaper and oozing with character. We booked for the next day and looked forward to one more night of AC based acclimatisation. I was pooped that night and also pissed off with myself for being so typically klutzy with my phone so Claire went out for a few beers while I got some R&R and tried to find my headphones which had also gone missing. We awoke refreshed and went out with a mission - moving into the Villa. As I tidied up the rubbish in the room I spied something interesting on a piece of paper, the phone number of a lost and found department on the receipt for the taxi! I had consigned the second phone of the trip to the memory bin and a glimmer of hope remained. After we had checked into the Villa i called them on skype. It was a difficult conversation for both parties involved, neither really knowing what was going on and twice they hung up on me – I don't blame them to be honest. On the third attempt I managed to get someone with a little English who was able to take the number of the guest house from me and seemed to commit to calling the taxi driver (his name was printed on the receipt) and then call me back. By the time I made it back to the Villa someone had indeed called and (again in very broken English) I got the picture that the taxi driver would be dropping it off at the guest house. Amazing! I left a 200 baht reward and the receipt with Lek the sister of the Villa's owner. Mildly safe in the knowledge that the phone would make it back eventually, I decided it was high time to celebrate with my second haircut and beard shave of the trip and and a manicure and pedicure for Claire. As we walked around afterwards, freshly beautified (or descruffed, whichever way you look at it), another stranger befriended us and told us about a festival in a wat further north that was free and would give us an opportunity to see some real Thai buddhism, not the touristy stuff. He didn't seem to be peddling anything so we took his directions and jumped on the 3 bus like he said. The conductor said that the bus didn't go there ... so with a fair amount of frustration we walked most of the way only to find a wat closed for renovations. Why do some Thai people go out of their way to give tourists the run around. At least I can understand the profitable enterprise of a scam but this made no sense. It's a pity really as the majority of Thais are really lovely and very friendly but this type of behaviour was steeling us into nasty ignorant “farang” (tourists), refusing to speak to anyone for fear of being lied to or ripped off. Another wat, the Golden Mount was nearish so we made for that instead. It's a beautiful manmade hill-temple topped with a gold leaf praang and temple, affording great views of the city and a welcome, breezy relief from the searing heat and high humidity. Monks dressed in their traditional saffron rang prayer bells as they walked up and down the mount making for an atmospheric afternoon. Back to the guest house to bad news – Tui (the Villa's owner and although surly had quite good English) explained that the taxi driver had called twice. I had to call them back and would probably have to go to the airport, 30km out, to pick up the phone. I asked why the change but got no satisfactory reply. As we were mid conversation the phone rang and interrupted us. I ran upstairs to tell Claire that I was going on the goose chase and would come back at some stage. Lek ran up the stairs after me and promptly fell back down the stairs badly, banging her head on the banister. I ran back down to see if she was ok. She said she was but I didn't believe her and so helped her to her feet and looking her in the eye to make sure she wasn't concussed. She was ok but had cut her foot quite badly somehow. She told me for the third or forth time to go down to Tui and finally I complied. It was the taxi driver who had called, Tui asked me to confirm something I said earlier about paying the driver 500 baht to drop it off. That seemed to do the trick and it was arranged. I felt responsible for Lek's foot so asked Claire to have a look at it and once that was plastered up, time for a refreshing cold shower. Even if there was hot water it wouldn't have been used. Later we went out to see the Khao San night life and sample some of those crazy buckets. A really good night bumping into an eclectic mix of an English girl and her Sri Lankan boyfriend who lived in a village near Colombo, on holidays, an Aussie who was married to a Sri Lankan but was engaging in some promiscuous infidelity in Bangkok and a gay Irish-Brazilian couple who had been living in Dun Laoghaire for a few years. Only on Khao San Road!